Cristiano Ronaldo underlined his G.O.A.T credentials in Portugal's 3-3 draw with Spain last time out, and is now sporting a goatee. Some thought he was claiming himself to be the greatest of all time (or GOAT, as all the cool kids say) but his coach, Fernando Santos laughed that off. "In Portugal, it is a common gesture to touch your chin. It means that you are satisfied," he said. And now Ronaldo may have cleared a few things up following Portugal's clash with Morocco on Wednesday, as he sported his new style. 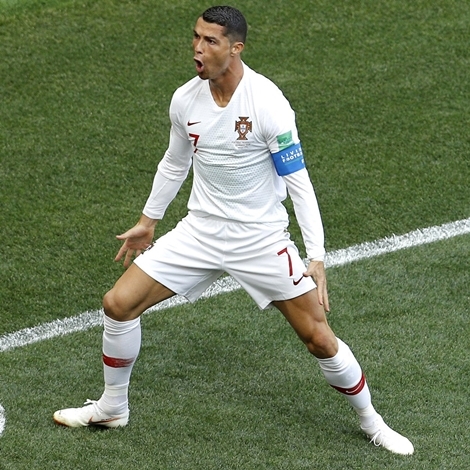 His fourth-minute goal proved enough to give his side the victory and control of their Group B destiny with just one game remaining and after the match, Ronaldo cleared up the mystery of his facial hair. Social media speculated that the goatee had something to do with a gesture he made after scoring the first goal against Spain, when he stroked his chin. Further speculation linked the gesture and Wednesday's new facial hair to a magazine story about Barcelona and Argentina rival, Lionel Messi, who was portrayed holding a goat in allusion to him being the Greatest Of All Time (G.O.A.T.). "This goatee? It's a joke I had with [Ricardo] Quaresma. We were in the sauna [before Friday's match against Spain] and I started to shave and I left the goatee. "I said if I score tomorrow, I would leave it for the rest of the tournament. And it gave me luck. I scored in that game, I scored in this one, so it stays."